Be the first to share your favorite memory, photo or story of Merttie. This memorial page is dedicated for family, friends and future generations to celebrate the life of their loved one. Merttie Opal Pringle, 94, New Matamoras, Ohio, departed this life at Westwood Place Assisted Living, Woodsfield, Ohio, following a brief illness on April 6, 2019, and was welcomed home by her loving Savior Jesus, her family, and friends who preceded her in death. 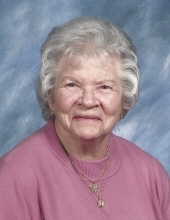 Opal was a member of Harrison Freewill Baptist Church, Minford, OH. Opal was born March 22, 1925 at Beverly, Randolph County, West Virginia, the daughter of James Henry and Polly Etta (Wegman) Bowen, the tenth of fourteen children. Opal’s mother died when Opal was thirteen; her sister Rosie stepped in as a mother figure and helped raise her. While working as domestic help on a farm, she met the “love of her life” Percy Junior Pringle who was working on the farm as a hired hand. When Percy left the farm for employment in Baltimore, MD, she felt she would never see him again. However, he returned to the farm and asked her to marry him. They were married December 3, 1940 in Catlettsburg, Kentucky; a marriage that lasted fifty-years until Percy’s death in 1991. Opal worked in a garment factory in Buckhannon, WV during World War II sewing uniforms for the military, while her husband served with the U.S. Navy in the Pacific Theater. Opal gave her life to Jesus around 1950 and became a life-long disciple of her Savior and Lord. She was persistent in inviting Percy to join her for worship services, desiring he would know the personal salvation experience she enjoyed, but he refused. Finally, after many months of asking, Percy agreed to go to a worship service with her at the Evangelical United Brethren Church, Alton, WV, where he accepted Jesus as Savior and Lord of his life. This decision forever changed their lives! Percy was called into pastoral ministry in 1955 in the West Virginia Conference, Evangelical United Brethren Church, and thus began a thirty-five years long joint ministry with Opal serving by his side as his greatest supporter and encourager. They served churches in Arden, WV, Rinard Mills, OH, West Portsmouth, OH, Marietta, OH, New Lexington, OH, Leesburg, OH, and various interim appointments in the Athens District, West Ohio United Methodist Conference, following their retirement. Opal carried out her ministry as a Sunday school teacher and held various offices in many church women’s groups. She was a lay speaker in the United Methodist Church. Opal’s faith was a shining example to others, and many peoples’ lives were forever changed by being in her presence and hearing how God had brought her through the difficult times in her life. Her life taught her to have the patience of Job, and the love of Jesus for all she met. She read her Bible from cover-to-cover each year for over forty years. Opal is survived by three sons, Jerry Lynn (Sylvia) Pringle, Tampa, FL; Terry Lee (Janice) Pringle, New Matamoras, OH; and Lonnie Ray (Carlotta) Pringle, Lewisville Lake, TX; daughter-in-law, Vicki Pringle, Jackson, OH; two brothers, Robert Bowen, Cleveland, OH; and Jimmy Bowen, Brunswick, OH: grandchildren, Michelle (Carlos) Mays, Wheelersburg, OH; Brian (Vickilynn) Pringle, Brandon, FL; Jeffrey (Chanc) Pringle, Pace, FL; Chad Pringle, Celina, TX; Jennifer Boles, Lewisville Lake, TX; Jennifer (Ryan) Lauer, Marietta, OH; Tiffany (Tyler) Schumacher, Woodsfield, OH; step-grandchildren, Shane (Kari) Williams, Jackson, OH; Joshua (Leslie) Williams, Portsmouth, OH; and Jessica Williams, Jackson, OH; great grandchildren, Erica (Jonathan) Eldridge, Megan (Shay) Lore, Zachary Mays, Madison Mays; Eliana Pringle, Daniel Pringle, Andrew Pringle; Alexander Pringle, Xaidyn Pringle; Ethan Boles; Leigha Lauer, Blake Lauer; Raylin Schumacher, Lucas Schumacher, Madeline Schumacher; step great grandchildren, Evan Williams, Katelyn Williams; JT Williams, Cameron Williams; and great-great grandchild, Averie Eldridge. Her children and grandchildren were a source of joy and pride in her life as she witnessed their many accomplishments. She was preceded in death by her parents; father and mother-in-law, Percy Hinkle and Rebecca Jane (Hosaflook) Pringle; husband Percy Junior; son, Larry Michael; infant daughter Karolyn; and siblings, Bessie Betty, Mary Alice, Rosie Ettie, Georgie Emaline, Junior William, Stella Anna, Viola Marie, Clinton Henry, Ada Jean, Olive Margaret, and Madeline Virginia. The family expresses its sincere gratitude to the management, staff and residents of Westwood Place Assisted Living for their loving and compassionate care of Opal over the past fifteen months at the place she has called “home”; and Amedisys Hospice for its employees’ care, support and assistance during her final days. In lieu of flowers, the family requests donation be made to Harrison Freewill Baptist Church, 12254 State Route 139, Minford, OH 45953-8715. Visitation is Tuesday, 2-8 pm, Hadley Funeral Home, New Matamoras Chapel, where funeral services will be held Wednesday at 10:30 am, with Pastor Terry Pringle officiating. Interment will be held at 3 pm, Upshur County Memorial Park, Buckhannon, WV. To send flowers or a remembrance gift to the family of Merttie Opal Pringle, please visit our Tribute Store. "Email Address" would like to share the life celebration of Merttie Opal Pringle. Click on the "link" to go to share a favorite memory or leave a condolence message for the family.